At Maplewood at Strawberry Hill, we are dedicated to the care and well-being of our residents living with Alzheimer’s disease and related dementias. We believe that while memory loss means living with certain challenges, it should not stand in the way of leading a life of dignity. Inspired by this belief, we created several levels of care to address the unique needs of residents with earlier, mid stage, and later-stage memory loss. Inspired by this belief, our emotion-based philosophy of care, HEART™ (Humor, Empathy, Autonomy, Respect/Reaching out to others, and Trust and Triumph), helps to engage residents so they can continue to enjoy life to their maximum potential. Please download our memory care brochure. *Administered under Special Care Residence License. As we age, our sense of taste often decreases - which makes eating fresh, flavorful foods even more important. Maplewood at Strawberry Hill offers Inspired Dining, a sensory-dining philosophy designed for residents living with memory impairment. Our residents enjoy fresh, farm-to-table meals that are flavorful and healthy. Inspired Dining allows residents to engage in a culinary experience that helps them live in the moment. 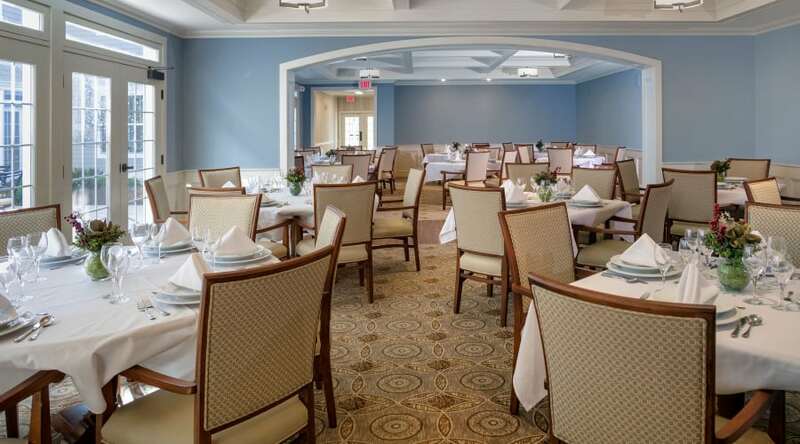 For more information on memory care or Inspired Dining in East Norwalk, CT, contact Maplewood at Strawberry Hill.